Valentina Napolitano explores issues of migration, medicine, religion, and gender in this incisive analysis of everyday practices of urban living in Guadalajara, Mexico. Drawing on fieldwork over a ten-year period, Napolitano paints a rich and vibrant picture of daily life in a low-income neighborhood of Guadalajara. Migration, Mujercitas, and Medicine Men insightfully portrays the personal experiences of the neighborhood's residents while engaging with important questions about the nature of selfhood, subjectivity, and community identity as well as the tensions of modernity and its discontents in Mexican society. Valentina Napolitano is a Research Officer at the Centre of Latin American Studies, University of Cambridge, and a Research Fellow at Clare Hall College, University of Cambridge. "Throughout this theoretically adept ethnography, Valentina Napolitano explores the embodied experiences of women and men to highlight their humanity. 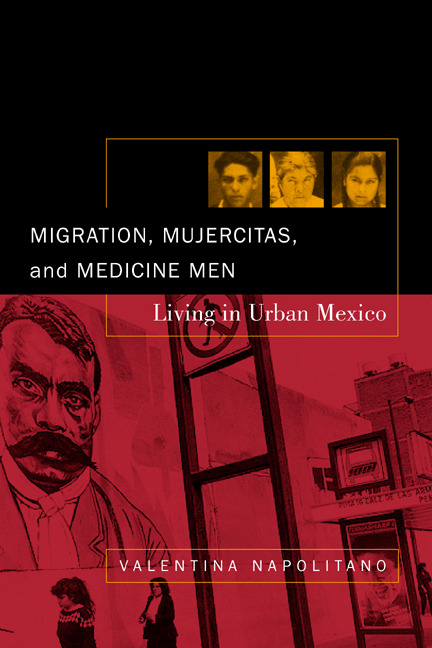 Covering topics as diverse as Christian Base Communities and alternative medicine, migration, and growing up female in Guadalajara, Migration, Mujercitas, and Medicine Men provides insights and analysis sure to provoke discussion in medical anthropology and Latin American studies. "—Matthew C. Gutmann, author of The Romance of Democracy: Compliant Defiance in Contemporary Mexico.